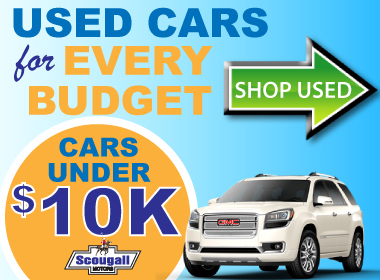 Scougall Motors has a history and reputation that is highly regarded in our community and the automotive industry. We are committed to provide sales and service to our customers at an unparalleled level delivered by a superior team of dedicated employees who assure the best sales and service experience. Our goal is to maintain the highest level of customer satisfaction by offering friendly and prompt attention, a professional and pleasant sale experience and/or a quality repair in our Service Department offered at competitive prices. Scougall Motors is proud to offer a full service Detail Centre that takes vehicle reconditioning to a whole new level. Scougall Motors maintains the highest level of ethical and moral standards in dealing with customers, employees, suppliers, all levels of government and General Motors. Call today for all your vehicle needs. AMVIC Licensed. All the staff that I dealt with were extremely friendly and courteous. There was no pressure into any specific vehicle or deal, just helpful advice and all the answers to my questions! Corbin was by the far the best before salesman I've ever dealt with. No pressure sales. Fast and personalized service! They made it easy finding the right truck for me and my family. They gave me the best trade in value for a quick turn around.